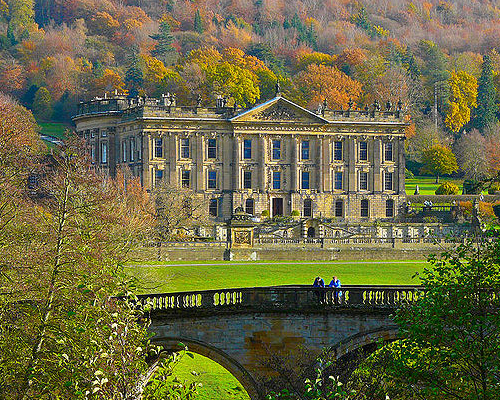 No trip to the Derbyshire Peak District could possibly be complete without a trip to the magnificent Chatsworth House. Built in the 1540s by Bess of Hardwick, Chatsworth is the hereditary seat of the Dukes of Devonshire. The house is situated on the east bank of the River Derwent, in between Derwent and Wye valleys. Chatsworth has three villages on it’s land, Baslow, Beeley, and Edensor. Visitors have several options available to them. You can buy a complete ticket which gives open access to aspects of the house, gardens and farmyard. Alternatively you can buy separate tickets. The house is set in large and rolling parkland, and backed by wooded hills and rocky moorland. The grounds often host rallies and fairs for enthusiasts of everything from classic cars to food or antiques. Should you choose to tour the house, you will not be disappointed. Chatsworth House contains a unique collection of priceless artwork, furniture, books and other artefacts. Chatsworth House is 10.1 miles (20 mins) from Endmoor Farm Holiday Cottages.